Biological Effects of Radiation, Second Edition aims to present an organized survey of the various experiments wherein living materials have been exposed to ionizing and exciting types of radiations. 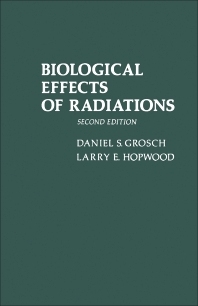 However, this book focuses on the effects of radiation to lower organisms, as these have received less attention. It tells how small amount of energy can damage submicroscopic structure and ultimately alter the appearance and abilities of such organisms. Divided into five parts, this book starts off with two introductory chapters in the first part. It explains the effects of radiation. Then, other parts of the book focus on the impact of radiation from cellular to organ level. How the lower organisms response is then discussed. Lastly, the book explains the interrelations between organisms in contaminated areas. Same with the first edition, emphasis is given on the consequences of mutations, as a whole chapter is devoted to this topic. Furthermore, this book covers discoveries from experiments with cultured cells. This book is a good text-reference for students and professionals. Also, it can be of great help to scientists, researchers, and specialists involved in the biological response to radiation.